Hurricane Harvey left Ty Boufford’s home with 8 inches of water when it struck the Houston area last August. For several days after, Boufford and his family were trapped in their Humble home because of street flooding. On Thursday, Boufford was once again cleaning up the aftermath of a flood, this time as an employee at Eleanor Tinsley Park in the city. Flash floods on Wednesday led to Buffalo Bayou flooding into the park, the cancellation of Fourth of July festivities, miles of submerged roadways and hundreds of stranded vehicles. In the park, blue letters set up in the grass to spell “HOUSTON” floated downstream. It was the worst flooding the city has seen since Hurricane Harvey hit nearly a year ago. Only a handful of structures were flooded, said Brian Kyle, a meteorologist with the National Weather Service. Unlike Harvey, which hovered over the city for days, yesterday’s storms came in heavy bursts, he said, falling at a rate of 2 to 3 inches per hour. By the end of the day, the Houston Police Department had towed 347 vehicles, 92 of which were stranded in the water. The remaining 255 were the result of accidents throughout the day. Rick Flanagan, emergency manager for the city, called it a “tremendous and intense” amount of flooding. Taking note of forecasts, he said, city police, fire and public works departments notified employees ahead of the holiday that extra manpower could be needed. It was. Involved departments continuously monitored the floods, he said, with police and fire departments feeding information about emergency calls back to Flanagan and his staff. Added public awareness also helped keep damage to a minimum, Flanagan said. 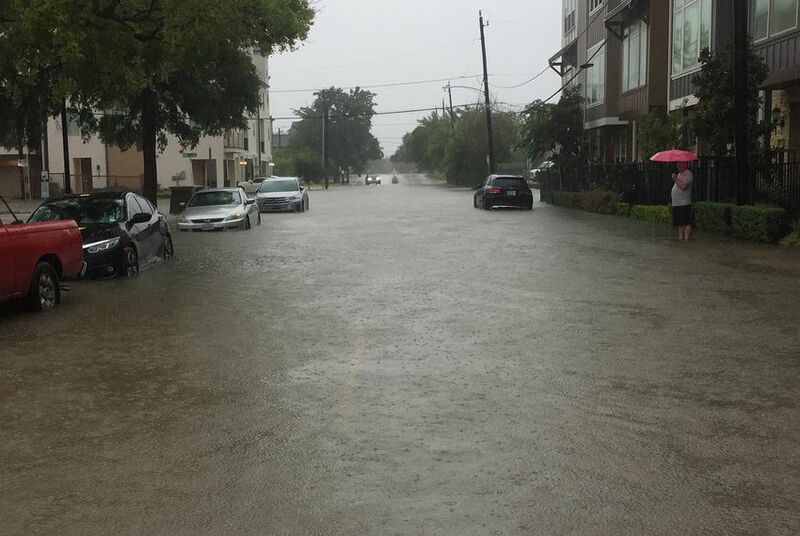 The city issued alerts warning residents to avoid unnecessary travel, and even Mayor Sylvester Turner tweeted warnings to residents. Had the flooding not occurred on a holiday, rush hour traffic could have made matters worse, Kyle said. Residents and business owners watched the rain cautiously. “Here we go again,” Amber Ely, manager of The Blue Fish Japanese Restaurant, said she remembered thinking. “I don’t think it will ever be like what it was during Harvey, but that’s still in the back of your head." Alice Kimsong said she trusted the city to take proper precautions but was still scared. Kimsong is the manager of Padthai Thai Restaurant, located near Buffalo Bayou, a flood-prone body of water in the heart of the city. After Harvey, the restaurant went without power for one month and was out of business for six months due to repairs. Scattered rain continued throughout the area on Thursday, but Kyle said residents should expect anywhere from no rainfall to a half inch heading into the weekend. Flanagan said with such heavy rainfall on Wednesday, slowed rainfall later in the day was a blessing for the city.